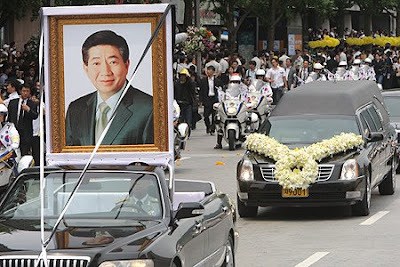 On Saturday, May 23 2009 the former president of South Korea, Roh Moo-hyun committed suicide. He was 62He ended his life by jumping off a cliff . He served as president of South Korea from 2003 to 2008. His funeral was on Friday, May 29 2009. The entire country has been in mourning this week. More on the story here.